Low-profile, quick-drying heat with touchscreen compatibility. Layer 'em underneath your mitts midwinter, rock 'em solo in the spring. The Burton Powerstretch® Liner Glove offers wind-resistant, breathable, and low-profile warmth that fits right in your jacket pocket or bottom of the backcountry pack. Four-way stretch mirrors your every move while the palm is enhanced with Screen Grab® for seamless control of any touchscreen device. 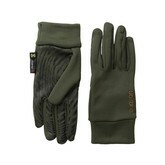 Layer the Powerstretch® liner under your gloves or mitts mid-winter or rock them solo when hiking. Ideal for shoveling, adjusting your bindings, operating two-way radios, or any situation where fancy finger work is critical in cold conditions.